I’ve been spending some time over the past few days making some new hand-embroidered toys. I used all natural materials to create the toys: wool felt, sheep wool stuffing, cotton embroidery floss, and cotton stockinette fabric. 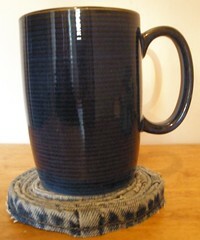 Wool felt zebra…only 3 1/2″ tall. I made a zebra like this one about a year or so ago that I gave away. Made another one this weekend for my daughters who enjoy playing with dolls. Miniature animals – whether they are stuffed, carved from wood, or glass – make their way into the girls’ play time and imagination. Since the zebra is for the girls, I decided to make a PDF pattern of the zebra that’s available in my shop (Harvest Moon by Hand) so anyone can make one. Another thing I made this weekend was a doll. 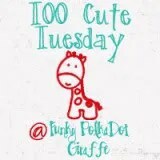 The pattern is from The Birthday Book – Celebrations for Everyone by Ann Druitt. I’ve had this book on my shelf for some time now, and just pulled it out recently for some ideas. I was pleasantly suprised to see all the different patterns for children’s toys. One of the patterns is for a “walking star boy and jester.” I started with the walking star boy since that was the first pattern and seemed a bit easier than the jester which requires a bit more sewing/embroidery work. The doll stands about 8 inches high (with the hat). I haven’t used stockinette fabric before, so this was my first attempt at trying to make a face and hands. I chose not to put a face on the doll because then whoever plays with the doll can imagine what it looks like and its expression – the doll can be happy, upset, resting – whatever the girls want the doll to express – rather than having the same expression that dolls typically have when they’re purchased from a store. Olivia was sick all day, so she rested in bed while I sat by her and made the doll. She chose the colors of the doll’s outfit and hair; and enjoyed watching the doll-making process. By late afternoon, the doll was completed…just in time for her to hold onto as she rested. In addition to providing comfort, the star boy provided Olivia with some entertainment while she was laying in bed. Because the doll has a horizontal slit in the back, two fingers can be placed in the legs. In this way, the star boy can “walk” and move around which is a bit different than other dolls the girls have. One idea I read about many years ago (and finally got around to doing this year) was to let children put their favorite stuffed animals or dolls be part of the Christmas celebration. This year, I had the girls put some favorite stuffed animals and dolls by the Christmas tree. 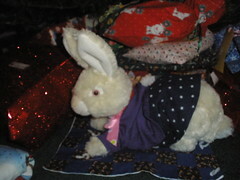 Olivia chose a rabbit that she dressed in doll clothes and put on a blanket. Sophia chose three dolls with accompanying pets who also sat on a blanket. The girls are wondering if Santa will do anything special for the dolls and animals. Santa did, indeed, give a little gift to each doll or animal that was placed by the tree. Since Sophia put three dolls out, each one received a tiny gift – a necklace, keychain, and crocheted heart. Olivia’s bunny received a coin purse with a tiny fairy tea set and a crocheted heart. Sophia, Olivia, and I also made some gifts in a jar. Sophia and I made lemon coconut cookie mix in a jar; and Olivia and I made brownie mix in a jar. These were given to my mom (the girls’ grandmother) with the instructions printed in 20 point type (since she has vision challenges). The instructions were glued onto decorative paper and attached to the jar ring with a ribbon. The lid was covered with matching decorative paper. This year, I want to make more eco-friendly gifts that use what I have on hand rather than using supplies I need to purchase. Although the financial benefits of doing this are a plus, the more important thing is that by using/re-using items rather than discarding them, I can make a positive difference on the environment. It’s a win-win situation. 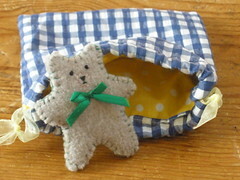 The little bear and bag are both made from recycled clothing. The bear is made from a wool sweater that I felted by the washing machine and dryer; and the outer part of the bag is made from a child’s dress. The inner fabric of the bag is from my fabric stash. 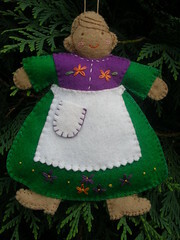 I have hand-embroidered wool felt toys and household items in my shop, Harvest Moon by Hand. Please take a look at some of the items that are available there…especially for the upcoming holiday season. Have wanted to make this ornament now for some time. Green and purple are my favorite colors, so that’s why I chose them for the dress. I’m going to make one for each of the girls with their favorite colors. I’m going to look for a slightly lighter shade of brown for the hands, feet, and face. I think this one was a bit too dark to show the facial features. 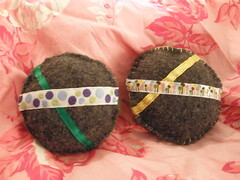 The felt is all 100% wool; and the ornament is stuffed with wool from sheep that I raised. The hand-embroidery features the straight stitch, blanket stitch, back stitch, French knots, and lazy-daisy stitch. I have some hand-embroidered ornaments in different styles in my Etsy shop; and also take requests for custom work. Please contact me through my blog and/or through Etsy for more information. This is a Sandman doll that I made recently. It is made with fleece and felt and is incredibly soft to the touch. He wants to help a young child fall asleep at home; be a travel companion in the car; or comfort someone who is sick or at a doctor or dentist appointment. 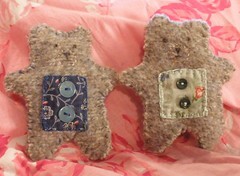 Every part of the toy is hand-embroidered – there are no loose parts. 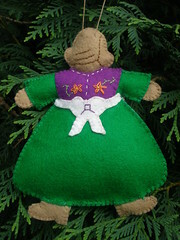 The face, stars, hands, and moon are all blanket-stitched onto the doll. 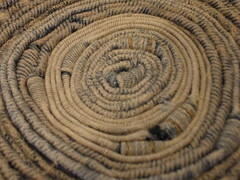 The Sandman is then hand-sewn together using the blanket-stitch around all the edges. He is stuffed with sheep wool – from sheep that I raised on my organic farm. The Sandman measures about 7 3/4″ x 4″ wide – a perfect size for small hands to hold. 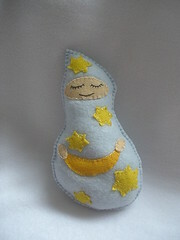 The Sandman doll is availabe in my shop, Harvest Moon by Hand at http://www.harvestmoonbyhand.etsy.com.